The Musée Picasso is an art gallery located in the Hôtel Salé in rue de Thorigny, in the Marais district of Paris, France, dedicated to the work of the Spanish artist Pablo Picasso . The hôtel particulier that house the collection was built between 1656 and 1659 for Pierre Aubert, seigneur de Fontenay, a tax farmer who became rich collecting the gabelle or salt tax (the name of the building means "salted"). The architect was Jean Boullier from Bourges, also known as Boullier de Bourges; sculpture was carried out by the brothers Gaspard and Balthazard Marsy and by Martin Desjardins. It is considered to be one of the finest historic houses in the Marais. The mansion has changed hands several times by sale or inheritance. The occupants have included the Embassy of the Republic of Venice (1671), then François de Neufville, duc de Villeroi; it was expropriated by the State during the French Revolution; in 1815 it became a school, in which Balzac studied; before housing the Ecole Centrale des Arts et Manufactures in 1829. It also housed the municipal École des Métiers d'Art. 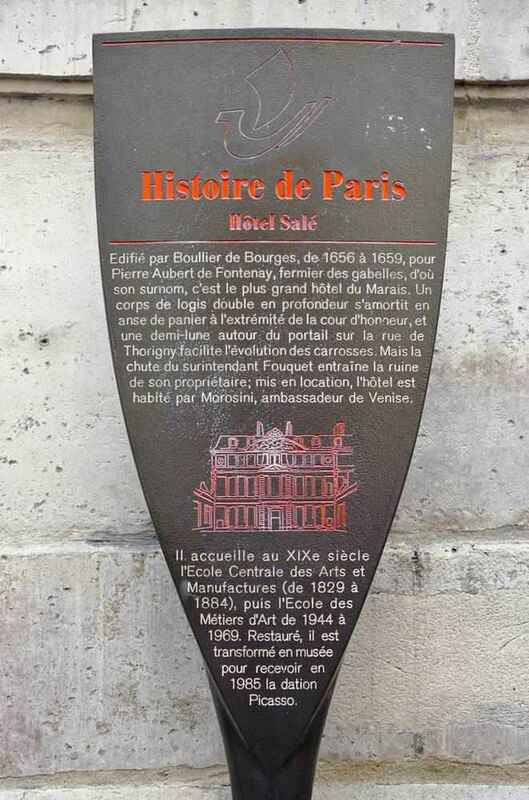 It was acquired by the City of Paris in 1964, and was granted historical monument status in 1968. The mansion was restored by Bernard Vitry and Bernard Fonquernie of the Monuments Historiques in 1974–1980. The Hotel Salé was selected for the Musée Picasso after some contentious civic and national debate. A competition was held to determine who would design the facilities. The proposal from Roland Simounet was selected in 1976 from amongst the four that were submitted. Other proposals were submitted by Roland Castro and the GAU (Groupement pour l'Architecture et l'Urbanisme), Jean Monge, and Carlo Scarpa. For the most part, the interior of the mansion (which had undergone significant modifications) was restored to its former spacious state. In 1968, France created a law that permitted heirs to pay inheritance taxes with works of art instead of money, as long as the art is considered an important contribution to the French cultural heritage. This is known as a dation, and it is allowable only in exceptional circumstances. Dominique Bozo, a curator of national museums, selected those works that were to become the dation Picasso. This selection was reviewed by Jean Leymarie and ratified in 1979. It contained work by Picasso in all techniques and from all periods, and is especially rare in terms of its excellent collection of sculptures. Upon Jacqueline Picasso's death in 1986, her daughter offered to pay inheritance taxes by a new dation. The collection has also acquired a number of works through purchases and gifts. Picasso once said "I am the greatest collector of Picassos in the world." He had amassed an enormous collection of his own work by the time of his death in 1973, ranging from sketchbooks to finished masterpieces. The Musée Picasso has over 5,000 works of art by Picasso including 3,700 works on paper, ceramics, sculptures in wood and metal, and paintings. This is complemented by Picasso's own personal art collection of works by other artists, including Cézanne, Degas, Rousseau, Seurat, de Chirico and Matisse. It also contains some Iberian bronzes and a good collection of African art, by which Picasso was greatly inspired. The museum also contains a large number of works that Picasso painted after his seventieth birthday. The museum has made an effort to present works by cartoonists who mocked or caricatured Picasso's work from the 1950s. There are a few rooms with thematic presentations, but the museum largely follows a chronological sequence, displaying painting, drawings, sculptures and prints. Other items include photographs, manuscripts, newspaper clippings and photographs to provide additional contextual information. The second floor has a special area set aside for temporary exhibitions and prints. The third floor contains the library, the documentation and archives department (reserved for research), and the curator's offices. 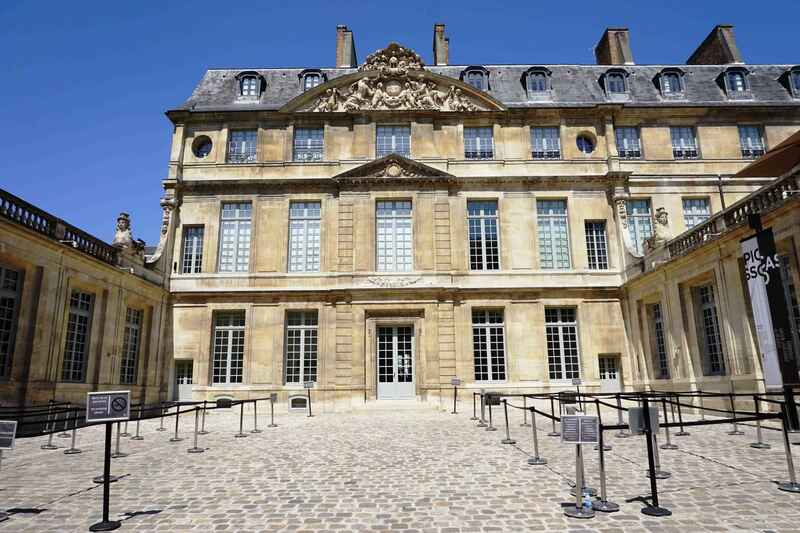 Musée Picasso | eTips Inc.